There ain’t many folks around here with a bike quicker or faster than Janette Thornley of Statesville, NC. That’s because she rides a seven-second, 180-mile-per-hour Pro Fuel Harley Drag Bike. 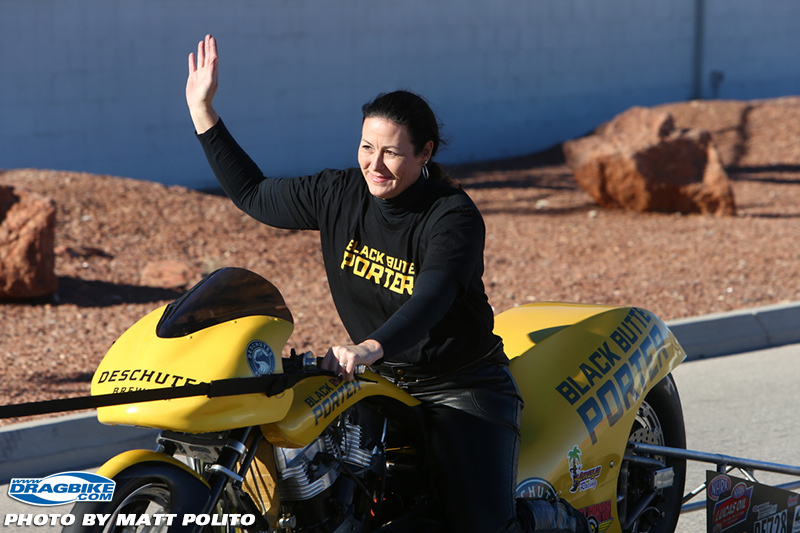 In her fourth season racing, Janette outran the country’s best on her way to winning the 2015 National Hot Rod Association Pro Fuel Harley Championship. 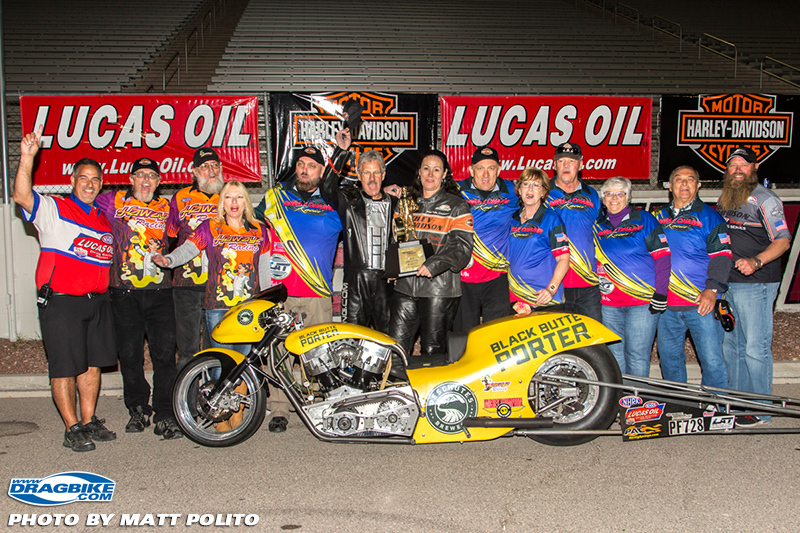 It came down to the season’s final race in the NHRA® Harley-Davidson® Drag Racing Series at the NHRA Lucas Oil Drag Racing Series Short Line Express Gambler Shootout in Las Vegas. 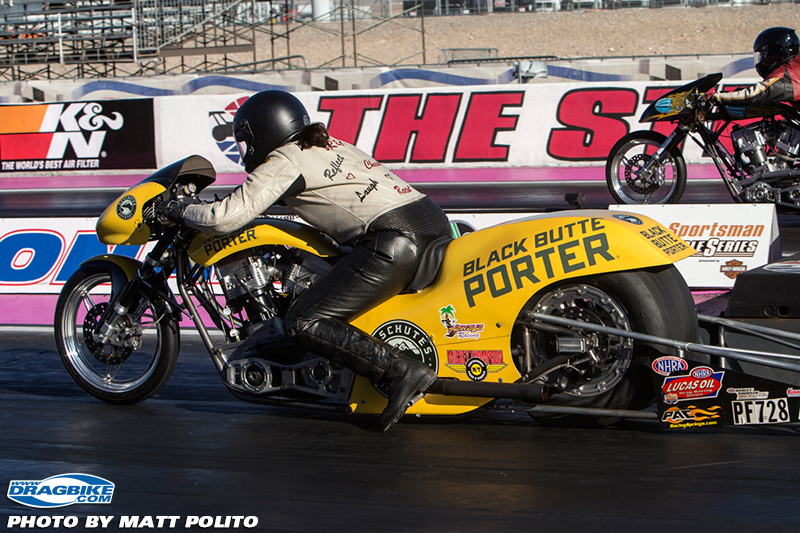 Janette took her Dream Chaser Racing/Deschutes Brewery machine to the finals five points behind Dennis Fisher. 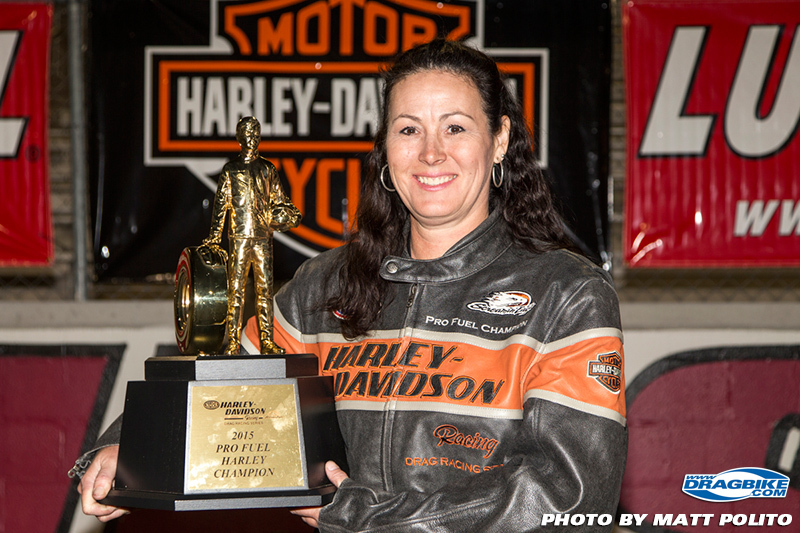 Janette clinched the title as she advanced to the final round of eliminations, losing to defending Pro Fuel champion Johnny Vickers of Miller’s Creek, NC. She competed in nine 2015 NHRA races, finished the season with three number one qualifiers, four event wins and 623 points, 28 ahead of Fisher. Janette also competed in Manufacturers Cup and American Motorcycle Racing Association events. Janette’s personal best elapsed time is 7.253 seconds at Valdosta, GA in November 2014 and best speed is 185.15 mph at Woodburn, OR in August 2012. Pro Fuel bikes are cool machines. This is the small class of nitromethane-fueled drag race bikes with 121 cubic inch engines, single-speed no transmission, and gravity fed carburetor. Folks who can make these bikes run right have always impressed me. Growing up in McMinnville, OR, Janette lost her father and brother who were killed by a drunk driver when she was young. She recalls a great childhood, raised by Mom and an extended family of brave uncles. Small towns are nice active places to grow up and play volleyball and basketball. Her father had motorcycles before she was old enough to ride so she was not raised with them. While in her late twenties and working at T. Rowe Price her boss was approaching his 50th birthday and said he was going to get back into motorcycles. That made her think of her Dad and a guy in college with a bike and suddenly she wanted to ride. After a motorcycle safety course, she bought her first bike in June of 1996, an 883 Sportster. Why a Harley you ask? Janette said for no other reason than name recognition. These days she rides a 2012 Road Glide and is working on an old 1958 English Ford Anglia that her father had before he was killed. Apparently she was quickly a good rider and became an instructor for the Motorcycle Safety Foundation. That led to working for Harley-Davidson’s rider safety program. She left T. Rowe Price and moved to Wisconsin. Janette traveled around the country to the dealers promoting rider safety. Two shops that grabbed her attention were Ray Price’s in Raleigh, NC, and Johnny Mancuso’s in Houston, TX. Both were long-time, legendary drag racers and had drag bikes on display in their shops. About ten years ago Janette bought a Sportster with wheelie bars and air-shifter and tried drag racing a few times that summer. She soon sold the bike. Years later, attending an AHDRA race, she hung out with Ray Price and knew she wanted to race again. 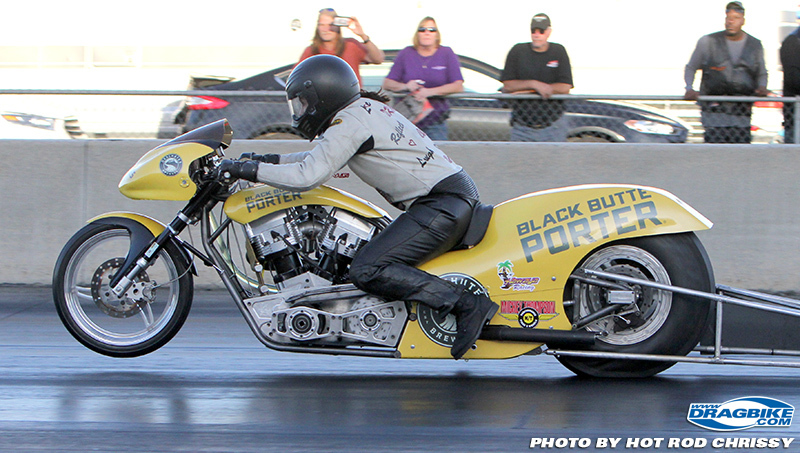 Janette is almost six feet tall and knew to be competitive she needed a powerful machine and started her quest to race a nitro bike. 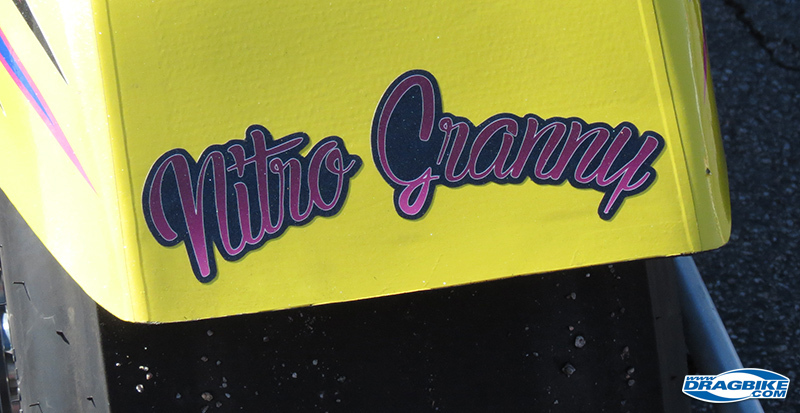 Ray invited her to Rockingham and some more races where her nitro goals got closer. 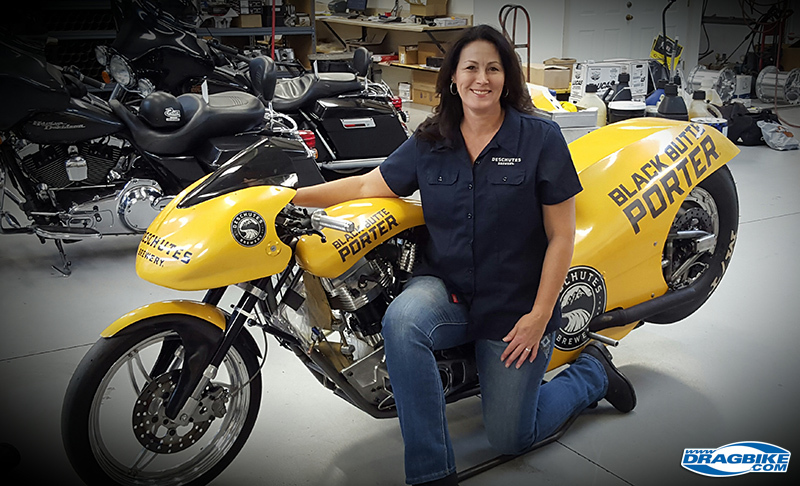 Once she sat on a Johnny Vickers Pro Fuel Harley, Janette signed up for his class on how to ride and race nitro. She passed the class, qualified for the race that weekend, and was really hooked. Soon she bought a Vickers Hawaya Racing Derringer engine Pro Fueler. Carolina Harley Drags fans first got to know Janette when she partnered with Ray Price to race. She bought the race bike and Ray’s crew maintained it, transported to the races and helped tune. “We have two rescue fur babies of our own. CC is Casino Cat. River or River Dog is our Red Nose Pit. Someone found her by the river hence her name. She’s been a great asset to our family and fits right in at the track. The two of them get along just fine. “I have a dream of riding a Top Fuel Harley someday. When is that someday? I’m not real sure but as I’m a witness to, I’m dreaming about it and will be ready when that day comes! For now I will continue to ride my 2015 Hawaya Racing Products built machine. For 2016 we have plans to race in the NHRA Harley-Davidson Drag Racing Series and other local sanctioned events.